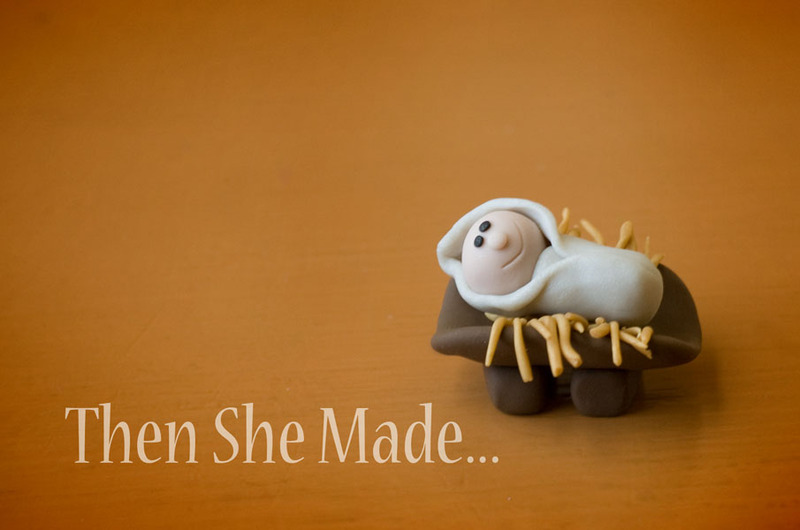 Some of you have contacted me with questions about my previous Nativity Experience post and thought I'd address them here. If you have other questions please let me know. Q: What did you make these out of? A: Polymer Clay - I'm kind of a addicted to Sculpey. Q: Did you include a note so the families knew what was happening and can you share it? A: Yes, we did. With their first delivery, which was a wise man, we gave them this certificate. 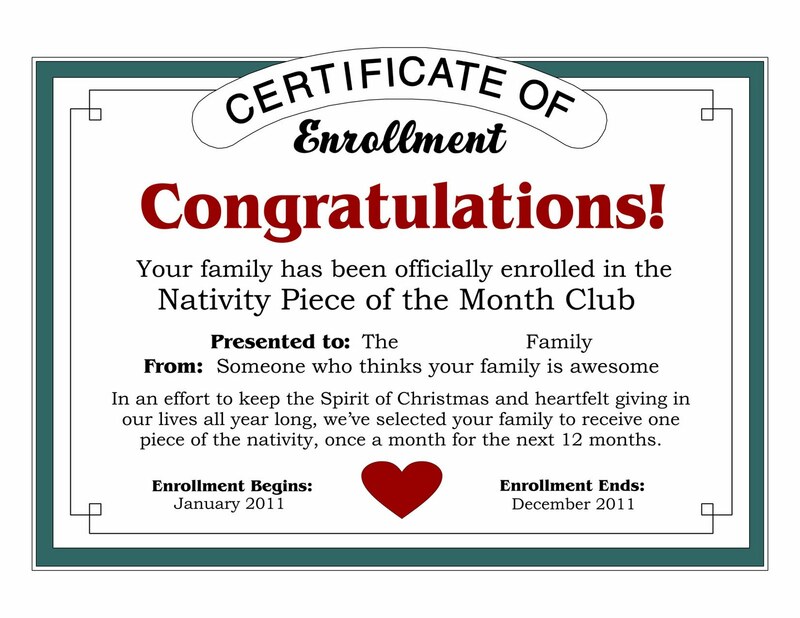 It states that they have been enrolled in the Nativity of the Month club. It also states why we were doing it. We also gave them a photo box that I decorated the outside of. This way they had a special place to keep all of their pieces once they arrived. An image of the certificate is below but I don't have any more of the boxes to show. Q: Will you share tutorials on how to make these? A: Hmmmm, not sure. It's a possibility but I'll have to think about it. I just finished making 5 other sets so I'm thinking IF I do a tutorial, it wouldn't be until next year. It would also depend on the interest level. Q: Was it hard to keep up on? A: It was something we looked forward to so it was constantly on our minds. However, life is busy and there were a couple of months that we almost didn't make it. The deliveries would get made on the last, or near the last, day of the month. Not ideal but we did it. I think that helped to keep the families in suspense. hahaha! Q: How did the families react? A: The whole experience was very positive. All of the families seemed to have fun with it. One mom, when we showed up on her door with the final delivery, cried. She said it had been ta great thing for their family. We had debated about just keeping the whole thing completely anonymous and never telling it was us. However, for the sake of my kids, I'm so glad we didn't do that. My kids got to see the positive outcome from this fun little project. They got to see how serving someone else and doing kinds deeds blesses everyone involved. I think that is all of the questions that have come in so far, if you have others please let me know. 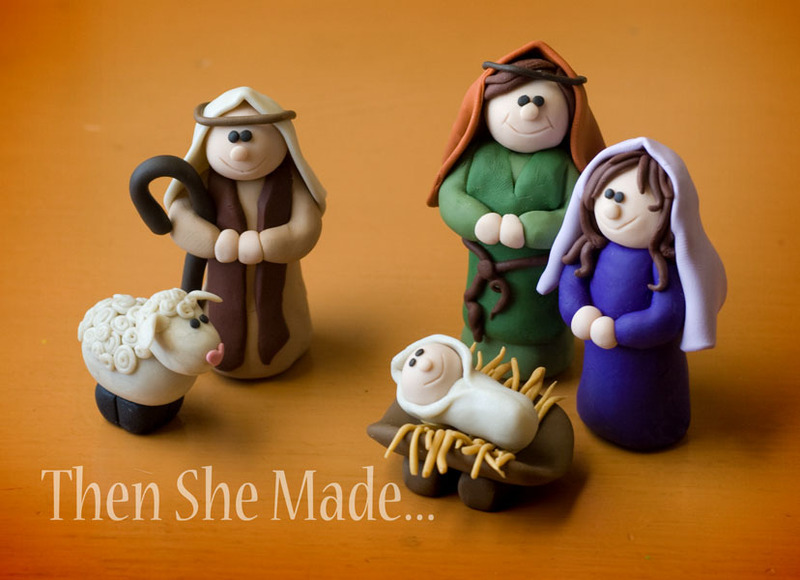 Also, if you are thinking of doing this for someone else, start watching the sales for Nativities. I made my own but there are some cute ones that you can buy in the stores right now. What a great idea! And your Nativity is super cute! What a wonderful idea! I would love to do something like this also..I tutorial would be great or if you know of a book or something to get the patterns from. I don't know of any book, I just made them up so I will think a little harder about doing a tutorial. I thought of using your idea and making my own set of cloth. My DD loves to sew and I thought we could maybe come up with a set made of fabric and some kind of filling. Again, thanks so much for the inspiration. and if you do decide to publish a book or do a tutorial I will be in line to get it too. I adore the Williams family!!!! You guys are so awesome!!!! Sooo precious. 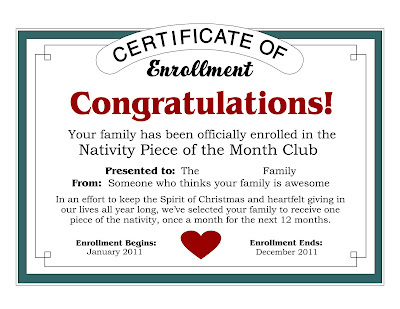 I love the idea of the Nativity club too. This is certainly a great way to keep the message of Christmas going all year long. If you do a tutorial, I would be interested ad well. I too, would LOVE a tutorial. What a great idea!! We just finished making our nativity out of the material you suggested. Can't wait to try it out this year. :) It's not perfect, but made with loving hands. LOVE, LOVE, LOVE it!!! My friend collects unusual nativities (has several hundred!!) so I would love to do this for her! I definitely don't have your talents though, so would need instructions (please!). I too would pay for them. Either way, thanks for sharing a great idea! Thank you for sharing the tutorial once a month. That is a Christmas gift for us that lasts all year! I probably will not ever take on this project but I can be remininded every month of this wonderful project and appreciate your creative ability. I love seeing how things are made. Thanks. This is an awesome idea! I would love to do this. Thanks for sharing! Love Love Love!!! I am so doing this next year!!! GREAT idea!!! thanks!